Within this collection are seven floral pieces featuring red roses: a casket spray, pedestal arrangement, pillow heart lid piece, tabletop arrangement, 18-inch open heart, portrait arrangement, and memorial urn arrangement. Each piece can serve a different purpose. The two different pieces that feature photographs could easily accommodate a keepsake or memento rather than a framed portrait. Add a custom printed ribbon to enhance any design within this collection. The Tranquil Gate Collection picks up on the soft tones of lavender and green and the bolder tones of royal blue and purple. The color of the blue hydrangea finds a space to tie the soft and bold together. 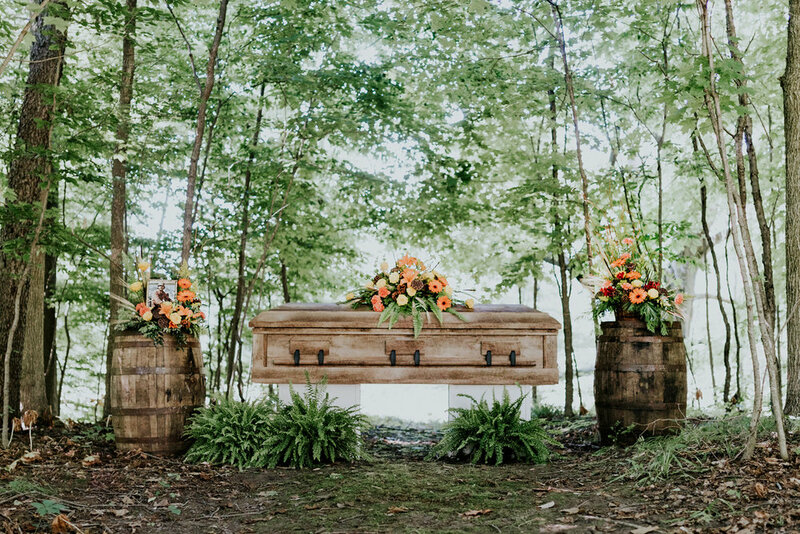 The collection features a casket spray with coordinating garland-style lid piece designed in wet floral foam to provide more longevity, as well as an easel arrangement, fresh flowers in a glass bubble ball, and a moon gate-style arrangement that can feature a memorial urn, portrait, or memento. The Honor Collection features pieces inspired by the American flag, a patriotic spirit, and military service. Within the Honor Collection the American flag is used in three different settings with flowers to complement. 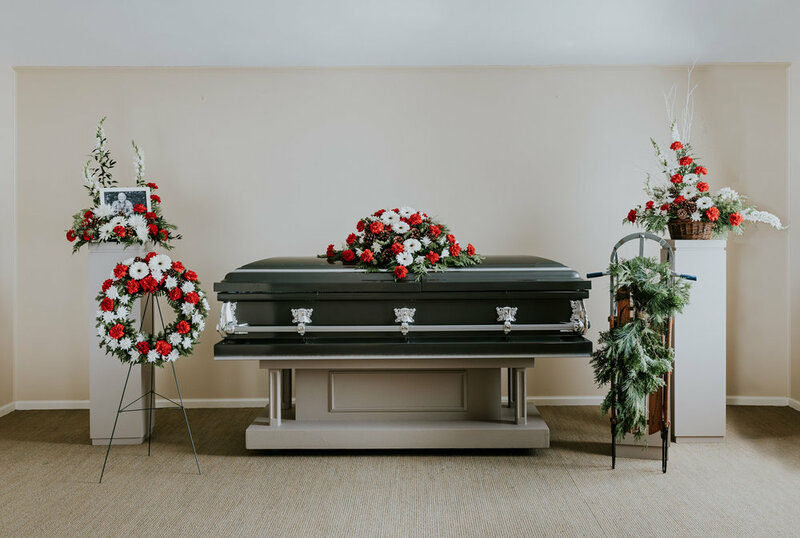 First, the flag is folded and placed in the corner of the casket lid and pictured with a floral casket spray, flag and wreath easel arrangements and an urn arrangement surround the casket. Then, the flag is featured in a wood case next to a memorial urn arrangement. Finally, the flag is laid on the closed casket with a pedestal arrangement positioned behind the casket. The depiction of the flag using fresh cut flowers is designed using a custom form cut from wet foam to provide more longevity. The flowers used in this collection are blue delphinium, red roses, and carnations with complementing greenery. This collection features hot pink roses, stargazer lilies, gerbera, iris, snapdragons, liatris, and blue delphinium. The bright blues, purples, and hot pinks are reminiscent of a spring garden. The collection includes a casket spray, two complementing compotes, an urn arrangement, and a wreath. 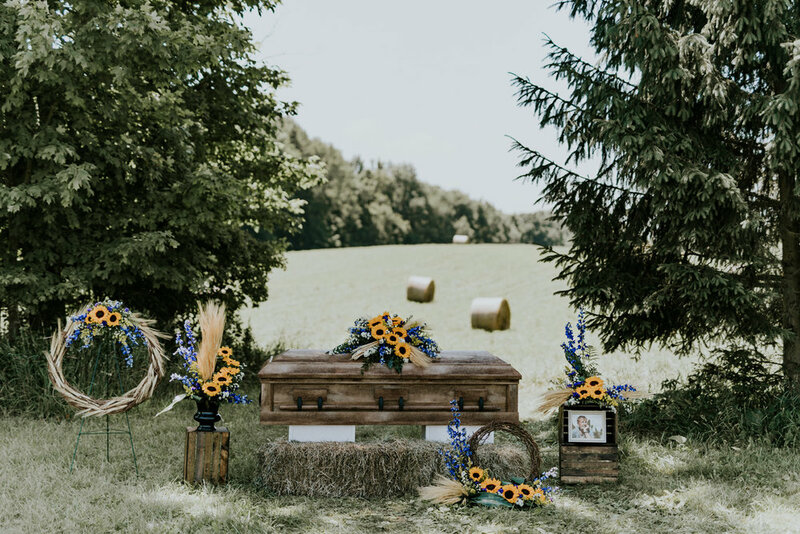 The collection features a casket spray, corner lid piece, compote, vase, easel arrangement, memorial urn arrangement, and both a portrait corner piece and arrangement. The memorial urn arrangement features a crescent of white roses. The flowers included within some or all of the collection pieces are red roses, white orchids, snapdragons, fugi, and carnations. 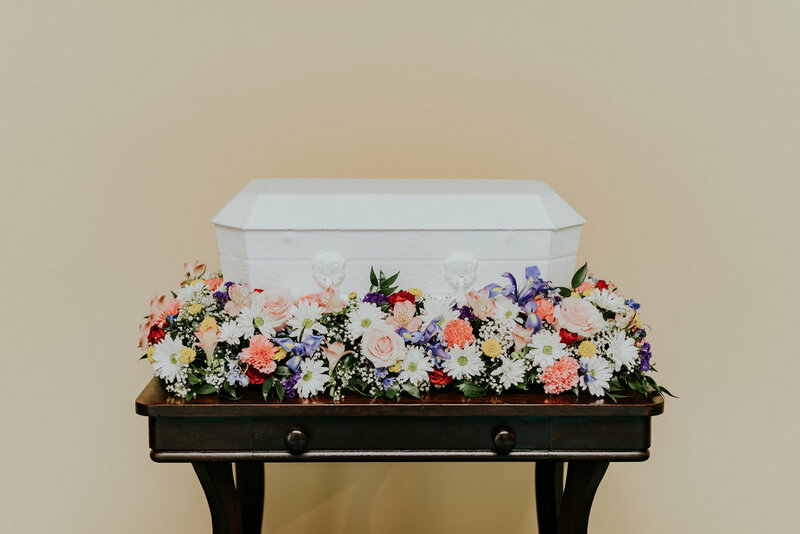 The collection is comprised of five floral pieces: the casket spray, a 36-inch grapevine wreath on an easel, a jardiniere arrangement, a pedestal arrangement, and a 24-inch grapevine wreath memorial urn arrangement. All the pieces utilize the elements of wheat, sunflowers, blue delphinium, and aster. The flowers utilized in this collection are yellow roses, orange lilies, gerbera, and carnations, in addition to the mix of natural greenery and materials. The collection includes the casket spray, basket arrangement, portrait arrangement, and memorial urn arrangement. 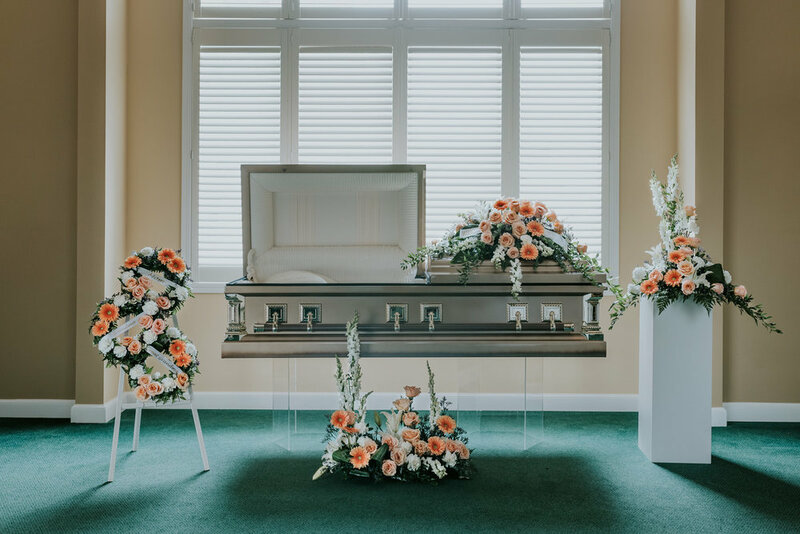 The collection features five floral pieces: the casket spray, floor arrangement, pedestal arrangement, generations wreath, and memorial urn arrangement. The memorial urn arrangement is designed as one piece but can accommodate two items. The generations wreath can emphasize the importance of family in one's life. Custom designed with three 12-inch wreaths and wrapped with custom printed ribbons, this is truly a memorable piece. This stand-alone piece beautifully surrounds a 24-inch infant casket. The flowers completely encircle the casket when it is placed in the elevated space in the center of the flowers. This stand-alone piece beautifully surrounds a 24-inch infant casket. The flowers completely encircle the casket when it is placed in the elevated space in the center of the flowers. This stand-alone piece is inspired by the Lake Michigan shoreline. Capturing the blue of the water and the green of the dune grass, the memorial urn arrangement is designed using blue hydrangea and delphinium, bells-of-Ireland, ruscus, and bear grass. An accent of shells is added to emphasize the beachscape. Other floral pieces can be designed in this same theme.